The J. Frederic Kernochan residence designed by Cross & Cross c. 1914 at 862 Park Avenue in New York City. Kernochan was an attorney and a founder of the Association of the Bar of the City of New York. His wife was a granddaughter of Stephen Whitney, prominent NYC merchant and a founder of Green-Wood Cemetery. At the time of Kernochan's death in 1929 he was living at 907 Fifth Avenue. 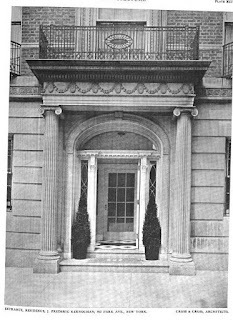 The residence at 862 Park Avenue has since been demolished. 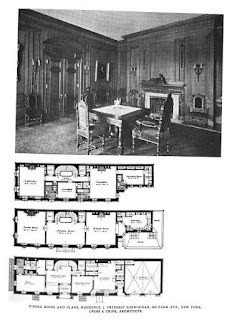 Am I mistaken that Kernochan's mother was a Lorillard? 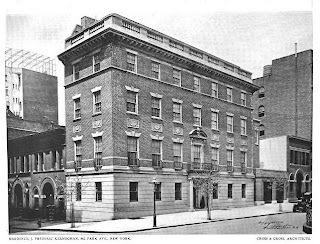 James P. Kernochan died in 1897 from injuries sustained after he was hit by a wagon on Fifth Avenue that was driven by 'Miss Baker', the only unmarried daughter of banker George F. Baker. So DED...the Kernochan featured in this post's brother James was married to Katherine Lorillard. His sister-in-law. By 1903 the only living brothers were J. Frederic and Walter. James P. Kernochan's only son, James Lorillard Kernochan, died at the age of 35 in 1903 at his estate 'The Meadows' in Hempstead from meningitis and the effects of a riding accident.